The Long Road to China: "Discover the Toasted Whole Grain Crunch"
She has recently figured out how to help herself to anything she wants in the pantry. I thought we were safe here because the handles were too high for her to reach. Ummmm, that did not stop her......she figured out what she needs to do to get in. Smarty pants! 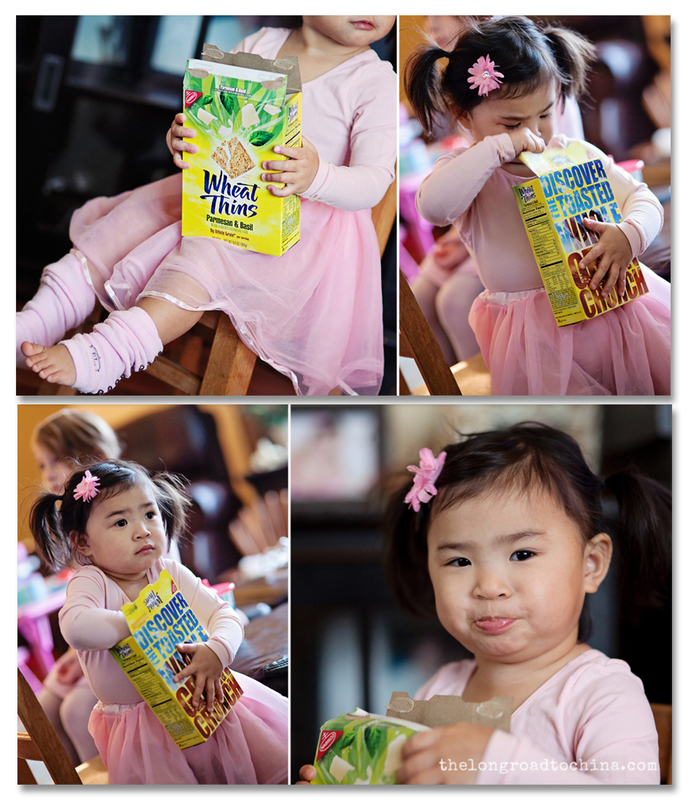 Love her chubby little hands clutching the box, her cheeks stuffed full of Wheat Thins, and that mischievous look on her face! These photos just make me laugh out loud every time I see them. She really is so cute. Liam shocked me too when he was younger. I thought he couldn't get into our pantry because of the height of the knobs. Well he just looked at the doors and decided to pull them from the bottom instead. Very smart indeed! She's got it all... the looks and the brains! I love it! She is beyond precious! Cute pictures of your little snacker! She is just adorable! These pictures just made me smile. She is too much. A girl after my own heart- love those with a little sour cream & chive cream cheese & some pepper jelly!